Do Stockton Police Care About Their City? 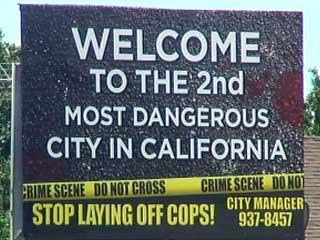 The billboards the Stockton Police Union has started putting up around the city are upsetting. They are bad for the city, and I don't think they help the police officers' cause in the long-run. Their generous contracts are killing the city's budget, it is an indisputable fact. The city's tax revenues are a function of the city's economy, yet the police union insists that their salaries are well above the average of a group of comparison cities with much higher income. And don't get me started on their pensions. I can understand the Police Union being upset about being asked to make serious concessions and they have the right to question them and make alternative proposals. However, as public servants, I expect that the well-being of the city is also something they consider. Apparantly not? Otherwise, they would not be hanging these destructive and deceptive billboards around the city. Complete with blood spatter. Wonderful. Last week, the FBI released statistics that showed crime in Stockton was down 14% in 2009, a greater decrease than the 5% avg. decline nationwide. Ordinarily, I would be giving the police kudos for their contribution to the decline, but that is difficult when they are exploiting the City's high crime rate for their personal profit. After all the grouching I have done about homebuyer tax credits, I must admit that I have finally hit the stimulus windfall. My AC isn't working and needs to be replaced - and until the end of this year there is a $1500 federal tax credit from the stimulus bill if I replace it. Am I receiving a windfall because it happened to break this year rather than next year? Yes. Is it actuallly stimulating any economic activity or energy savings? Maybe. Without the tax credit, I may have opted for a costly repair job rather than replacement. And I had to bump up to a slightly more energy efficient system than I might have otherwise chosen to get the credit. I probably would have made these choices without the tax credit incentive, but the presence of the tax credit made replacing with an energy efficient unit the easy choice. What do I plan to do with my $1500 rebate? I will get it on next year's tax refund, so it isn't exactly timely stimulus, but I suspect I will pay down debt. This post is a little personal, but it does speak to a serious issue with the Valley and larger California economy - the quality of public schools. The problems are much more than funding, although current budget cuts are making the problems worse. My wife and I just made a difficult decision to move our children to private school, our youngest will move next year and our oldest will stick with her public school through 8th grade and move when she starts high school. This was a very tough decision as we have always felt strongly about community, public schools and my wife is a former public school teacher and is the daughter of public school teachers. Finding the extra cash for tuition isn't going to be easy either. I will not name the schools my kids currently attend, but it is a generally well-regarded school district. Based on our conversations with folks, the problems we have encountered are fairly typical of California schools. There are a number of issues, but the most important for us have been low standards and off-loading due to overly rigid enforcement of class size limits. Low Standards. I am amazed at how easy it is to earn an A+. More than grading standards, the curriculum and reading lists are very weak. We really feel California standards are a solid year behind what we left in Maryland, and almost 2 years behind what our kids were actually doing because they do much less to differentiate instruction and assignments here. Our kids basically repeated 6th and 3rd grade and were bored to death. Most of my daughter's 7th grade reading assignments are things she read in 5th grade in Maryland. Off-loading the new kids. Perhaps our experience has been exceptionally bad, but I have heard from others about how virtually all newcomers to California school districts are "off-loaded" to other schools. This is an absolutely terrible thing to do to new children and families when they move to a community, and it seems to be a common "welcome to California" experience. Two years ago, my oldest daughter went through a nightmare experience being off-loaded to a school that was an hour bus ride away because she put the 6th grade class 1 student over the limit in the teacher's union contract. It was a nightmare, and we ended up pulling her out and home-schooling her for 6th grade. Now it is my youngest daughter's turn. Due to the budget cuts, teacher layoffs, and increasing class size; we learned two weeks ago that our 3rd grader was being off-loaded for 4th grade. This was the final disapointment that made us decide to opt for private school. Small classes are desirable, but not everything. Elementary class sizes are small in California, but I feel like too much has been given up to acheive those class sizes. There have been other disapointments with the schools (virtually no art, music, foreign language before high school; little differentiated instruction, disgusting lunches; no lockers; too many videos in class, etc., etc. ), but I will stop rambling. We love everything about our move to California, except for the schools. Improving public education is a major economic challenge for the state. It is more than just workforce development, it is also a critical quality-of-life issue if we are going to attract and retain high-skill employers and employees who care a lot about the education of their own kids. Sunday's Sacramento Bee contains a trio of articles on immigration, including an essay by Paul Wenger, President of the California Farm Bureau Federation, entitled "Pass AgJobs Plan to Allow Seasonal Workers." The article is incredible, because it leaves out the controversial, key piece of the AgJobs proposal. The "innovation" in the AgJobs program is to allocate 1.35 million green cards to the agriculture industry. Immigrants who can document five consecutive years of agriculture work would be eligible for permanent, resident status. That's a large and unprecedented, government granted "retention bonus" to ensure a steady supply of farm labor and keep wages low. It basically legalizes a 5-year revolving door, where roughly 250,000 to 300,000 low-skill immigrants come to the U.S. each year under the program, work farm jobs for 5-years, then will move out of agriculture when they get their green card. It's a very bold and controversial proposal. We need a system that allows people from other countries to enter the United States - legally - while farm jobs are available, and to return to their home countries once the harvest season ends. Fortunately, we have a solution to offer. It's a bill that goes by the acronym AgJOBS, re-introduced by Sen. Dianne Feinstein last year. The Agricultural Job Opportunities, Benefits and Security Act would reform existing temporary-worker programs for agriculture, to provide the sort of flexibility that would allow farmers in California and throughout the country to be assured that the people they hire have entered the country legally. AgJOBS is a major change to immigration law that deserves serious debate. It's proponents in the agriculture industry should describe it honestly. ... the solution to farm worker problems is not a guest worker program that leaves the farm labor system unchanged. Even most farmers concede that history would likely repeat itself if illegal immigration were to be controlled and there were no new guest worker program. Wages would rise, there would be a rapid adoption of labor-saving machinery and better ways to manage now more expensive workers, and some crops might migrate to lower-wage countries. Another month of moving sideways in the California job market. Unemployment remains at it's all-time high at 12.6%. California non-farm employment is up to 14,200, however federal government employment increased by 13,600 - primarily temp jobs through the Census. The state has been lagging about a quarter behind the U.S. recovery, and if that pattern holds we should finally start seeing solid job gains in California in the next 2 months. In the Valley, April is the month when unemployment moves down with seasonal patterns and we saw normal seasonal decreases across the board. I think we can finally say we have seen the worst of the sky-high unemployment rates. Outside of a surprisingly low decrease of 200 durable goods manufacturing jobs in Stockton, the NUMMI impacts are not readily apparant in the data. NUMMI was very apparant in the East Bay with a direct loss of 4500 transportation equipment manufacturing job. The impact was large enough to offset some modest growth in other areas so that the East Bay lost more than 2,000 jobs on a seasonally adjusted basis. San Francisco has yet to see job growth. The South Bay continues to be the only area in Northern California that is showing clear job growth, mainly due to the recovery of the technology sector. It's been at least a month since I have ranted about what a bad economic stimulus policy this new state homebuyer tax credit is. It mostly moves home sales around a few months in time, while granting windfalls to the people who are benefiting most from the trough in the real estate cycle. Some first-time buyers delayed scheduled April escrow closings until May to qualify. "We had Realtors in the field say that was happening," said Appleton-Young (California Association of Realtors chief economist). That might be a small, partial explanation for a fall in closed escrows from March to April, said Bob Bronswick, president and chief operating officer of Coldwell Banker Residential Brokerage in Sacramento and Lake Tahoe. He said some buyers managed to snag both the state credit and an $8,000 first-time federal credit that expired April 30. Written by National Geographic or ACWA? Earlier today, I was given a copy of Water for Tomorrow magazine. Fallowed farmlands also translate into unemployment. According to Richard Howitt, agricultural economist at the University of California at Davis, the Central Valley’s local economy has already lost tens of thousands of farm and support jobs. This is presented much differently than in National Geographic. I won't get into the details here, there are plenty of other posts on this blog about that. Water for Tomorrow is published exclusively for ACWA by: Onward Publishing, Inc. in partnership with National Geographic. The magazine was copyrighted to ACWA with all rights reserved. None of the articles listed authors. Wendy Murphy, editor-in-chief, is a VP at Onward Publishing whose website says Onward "has a proven expertise in creating and strengthening world class brand images". I am curious about the National Geographic Society's role in the "partnership." It doesn't appear to involve actual journalists, the use of their fact checking department, or even much in the way of photos. I could find no reference to Onward Publishing or Water for Tomorrow in National Geographics extensive websites. It has lots of beautiful photography like National Geographic, but most of the photo credits were to DWR. Q: How did you go about making the PBS series “California’s Water”? I am very interested in readers' opinion about this style of publishing, especially if you are a journalist, part of a non-profit education foundation (like the National Geographic Society), or ACWA. Please leave a comment (you can be anonymous). Update, 5:00 PM, May 19: Many, many views but no comments. It seems that I'm too old-fashioned. I need to get with the times and create some "partnerships." Are Mortgage Delinquencies an Economic Stimulus for the Valley? With over 18% of mortgages in San Joaquin County over 90 days delinquent, it is safe to say there are a lot of people not making monthly payments for their housing right now. Mark Zandi of Economy.com compares this effect on a nationwide level to a mini-tax cut that is helping to support consumer spending. All told, borrowers who aren't making mortgage payments are probably skipping roughly $100 billion annually, an amount equal to 1 percent of consumer spending, according to Mark Zandi, chief economist at Moody's Economy.com. Zandi likens the money to "a form of stimulus, a little tax cut." Not all of that "tax cut" is being spent on iPads, vacations, and lattes. "Presumably these homeowners know they're going to have to start paying again" to live somewhere, says Zandi. He suggests that falling delinquencies on credit cards and auto loans may be a sign that homeowners are using mortgage money to pay down other debt. Presumably, the effect is even larger in the Valley. Here are some very crude back of the envelope calculations using San Joaquin County as an example. I estimate that there are at least 15,000 households in San Joaquin County in this category at the moment and it could be as high as 25,000. The average mortgage payment is a little over $2000 per month, so we are looking at $30-50 million per month in missed mortgage payments, let's call it $500 million per year. Total personal income in the county is about $20 billion per year, and disposable, after-tax income is probably around $15-16 billion. So, the skipped mortgage payments are equivalent to boosting local disposable income 3%. The rental value of those housing units (what these households will probably pay on the other side of eventual foreclosure or loan modification) is probably about half the mortgage payments, let's call it $1000 per month. So one could argue that the end of the foreclosure crisis will drain $250 million per year out of local spendable income. Add it to the growing list of reasons it is going to be a long slow recovery. I have no doubt this has helped cushion the recession locally, a lot of the local real estate losses are being endured by mortgage investors far, far away. As horrible as this recession has been in the Valley, it really could have been much worse. I am much less convinced that there will be a big drag on the recovery when more people in the Valley start paying for housing again, but it is something to ponder and debate. One thing is for sure. The Valley Economy is not boring. Will Placerville Increase Sales Tax to Subsidize Water? It is hard to think of two common government policies in the Valley that I dislike more than subsidized water and funding local governments with sales tax. So I found this story about sales tax in the Sac Bee very disapointing. The article is not about water, it is about how Placerville's strategic location is ideal for extracting sales tax from visitors. They achieve high sales tax revenue without the auto malls, big box stores, and sprawling malls favored by most other cities. Then, it goes on to describe a proposal for Placerville to combine two of my least favorite policies in a single package. Of course, it's popular and it makes complete sense for them to pursue this strategy given the incentives they face. The idea is not to reverse the dollar losses, but to cope with recent hikes in water and wastewater treatment fees. By raising sales tax – much of which is paid by visitors – water and wastewater fees could be cut by 10 percent and 33 percent, respectively, Warren said. According to this announcement from the Law School, Pacific McGeorge alum and faculty member (and former Assistant Secretary of Interior and Superior Court Judge) Craig Manson will be joining Westlands' high-profile legal team this summer, joining Pacific McGeorge alum Tom Birmingham. I figure it's only a matter of time before Westlands goes to Pacific for their economics expertise too. Should the Valley Have Its Own Currency? If the Central Valley had its own currency, what would you call it? When we are feeling a little silly and depressed about the Valley economy in the Business Forecasting Center, we wish for a bout of runaway inflation. We've been chatting about this for 2 years, but Paul Krugman's column in the New York Times today launched a discussion about what if California had it's own currency in the global econ blogosphere. I say the heck with California, why can't the Valley have it's own money. We are definitely feeling the pain of asset deflation around here (most obviously trapping people in underwater mortgages), and prices and wages are showing their usual downward rigidities (prices go up much easier than they come down, especially in labor markets) and the lack of price adjustment can create unemployment (take a look at local government employee and teacher contract negotiations for a public sector rather than market example, jobs are being cut rather than wages). Anyway, lot's of blog chatter on optimal currency zones today. It's a purely academic topic, but interesting to think about nonetheless. Here is what Ryan Avent at the Economist said -think of substituting Central Valley for Greece and substitute California or the US for the Europe as you read this. Why is this important? Well, the problem in Greece right now is that the Greek economy is at a very different point in the business cycle from the euro zone as a whole. It's still in recession, while most of Europe's large economies are in recovery. And it's still in recession, in part, because labour prices are too high given available demand. To fix this, Greece could cut prices. It would like to do this through inflation or depreciation, but those options are off the table because it is a member of the euro zone. Instead, Greece is stuck trying to reduce nominal wages, which is difficult to do. Alternatively, Greece could boost demand. But Greece doesn't have the fiscal room to do this given the stance of the euro zone's monetary policy, and its high debt load. There is another possibility, however. Greeks could leave the country. They could move to stronger economies until Greece's labour market tightened up, placing upward pressure on wages. If you can't shift prices, you can always try reallocating demand. But this is more difficult in places were languages, cultures, and institutions vary significantly across borders. I was completely ignorant of the unnecessary drowning deaths in the All-American Canal until this recent 60 Minutes report. It is shocking and sad. For the past year, I have been listening to Paul Rodriguez and others in the Latino Water Coalition suggest (wrongly) that farm workers in the San Joaquin Valley are dieing because environmentalists and people like me support reduced water deliveries from the Delta that lead to some fallowed fields. Here we have a farm water irrigation project that no one disputes is killing hundreds of Mexican immigrants, and the solution only costs $1 to $3 million. Where is the Latino Water Coalition? Where is the protest? Where is the march? Just in case 60 Minutes got the story wrong (they have been known to flub reports on California water), I read the Imperial Irrigation District's response. They say they support safety features in the canal, but other water agencies are also responsible for the cost, not just them, and that 60 Minutes forgot to mention that the concrete lining saves enough water to irrigate a few thousand acres of land each year in addition to killing people. I am all in favor of measuring both benefits and costs, but I don't think that gets them off the hook. It looks to me like we could afford to spend $300 million to save some water, but not afford an extra 1% in cost to save hundreds of lives. Unbelievable. Update: I was happy to see a report that Paul Rodriguez of the Latino Water Coalition canceled a show in Arizona and made a public statement condemning Arizona's new immigration law. As a latino leader in the water exporter community, it seems natural that he would step up to get something done about the All-American canal too. The birth rate — based on births per 1,000 women — dropped 2.8%. The state had the third-highest birth-rate decline, behind Arizona and Mississippi, according to a Pew Research Center report released earlier this month. A check of the number of births in the Valley showed similar declines between 2007 and 2008 — a 3% drop in Fresno County, 2.9% in Madera, 2.6% in Kings, 4.9% in Merced. Births in Tulare County remained steady. Pew researchers said they found an association between deteriorating economic conditions and people’s decision to have children. A nationwide survey in October found 14% of people between ages 18 and 34 — and 8% of those ages 35 to 44 — reported postponing a child because of the recession. The decision to delay childbearing appeared greater among low-income families. Nine percent of people with incomes of $25,000 or less said they had postponed having a child, compared to 2% with incomes of $75,000 or more, the researchers said. The number of unauthorized immigrants in the United States is estimated to have decreased 7% from 11.6 million in January 2008 to 10.8 million in January 2009, according to the Department of Homeland Security Office of Immigration Statistics. A 1 million decline between 2007 and 2008 coincided with the nation’s economic downturn, the government said. But Philip Martin, a professor of agriculture and labor expert at the University of California at Davis, said the impact of immigration on birth rates isn’t yet clear. “Recession, reduced immigration — we really won’t know which is the main factor until another year or so passes,” he said.